Royal wedding: Where will Meghan and Harry spend night before? Meghan Markle will spend her last night before her marrying Prince Harry at a luxury Buckinghamshire hotel. Ms Markle and her mother Doria Ragland will stay at the Cliveden House Hotel, about nine miles north of Windsor Castle, the venue for her big day. The prince will stay at the Dorchester Collection's Coworth Park in Ascot, with his brother and best man, the Duke of Cambridge. The details were released five days before Saturday's wedding. 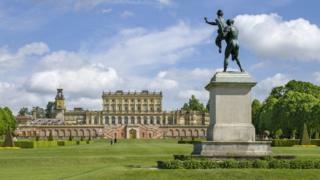 Cliveden House, where Ms Markle will stay, is on the National Trust's Cliveden Estate in Taplow. It has 34 bedroom and nine suites, including one named the Prince of Wales Suite - which costs from £1,535 a night. Its website describes how, for more than 350 years, the hotel has hosted "powerful personalities, debaucherous parties and scandalous affairs". Cliveden was linked to a 1960s political scandal - the Profumo affair - as it was where war minister John Profumo first met Christine Keeler and started a relationship. The privately owned stately home was built in 1666 by the 2nd Duke of Buckingham as a gift to his mistress. Meanwhile, Prince Harry will be staying 15 miles away at Coworth Park, located about seven miles from Windsor. It says it offers guests "an experience to refresh every sense within our welcoming oasis of calm". A hotel spokeswoman said rates were only available "on application" but hotel suites cost from £558 per night. Prince Harry and his brother regularly play on the hotel's polo grounds - and Ms Markle was among the spectators last year. Image caption Coworth Park describes itself as the "scenic route to five-star bliss"
Earlier this month it was revealed that Ms Markle will travel with her mother to the church by car while Prince Harry will arrive with his brother. Ms Markle will then meet her father, Thomas Markle, at St George's Chapel, where he will walk her down the aisle. With five days to go, Kensington Palace also announced the couple's first official engagement as a married couple. Three days after their wedding they will attend a garden party in honour of the Prince of Wales at Buckingham Palace. The event on 22 May - the Prince of Wales's 70th Birthday Patronage Celebration - will be Ms Markle's first royal garden party in the grounds of the Queen's London residence.